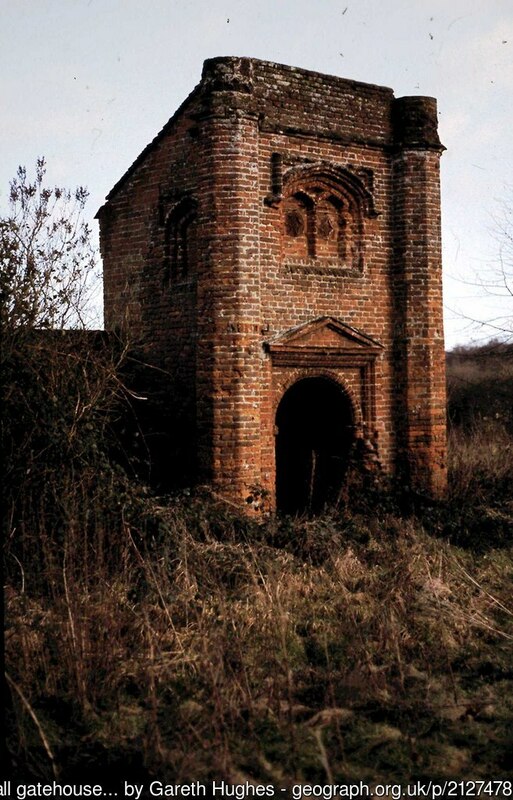 A secret tunnel is said to run between the mainly 14th century church of St. Helen (TG356148) and the ruins of St. Benet's Abbey (TG383157) less than two miles across the river Bure. In it is said to be buried a vast amount of treasure belonging to the abbey, guarded by the phantom of a huge dog. "Human bones have in recent times been found in the adjacent osier carr, which some say was a burial ground belonging to the Priory....The villagers still believe that they sometimes see ghostly forms flitting at dusk through the trees near the building (the site of Ranworth Old Hall, at TG344153). Money is said to be buried near the old gateway, placed there by St. Benet's monks to escape Henry VIII's rapacious hands. Some little while ago a man digging in the garden hard-by came upon a brick culvert, probably part of the old drainage arrangements, and of course it lent colour to the old belief that a tunnel existed between here and the Abbey".2 (See also South Walsham). 1. J. W. Day: 'Portrait of the Broads' (Robert Hale, 1967), p.47. 2. 'Norfolk Archaeology', Vol.21 (1919-23), Proceedings 1922, p.lviii. About halfway between Redenhall and Harleston a lane from Starston joins the main highway, forking as it meets the road. Both forks dip sharply down into the valley of a small stream that flows close by, and in the enclosed triangular piece here, covered with scrub and tall thorns, stood once a willow tree by the name of Lush's Bush (TM254843). It was cut down at the end of the 19th century, but in the churchwarden's accounts for Redenhall is the entry, in 1668, "For planks and worke about Lush's bush and cutting of it...7s 6d". The tree, sometimes called Lush Bush, was said to have sprung from the wooden stake driven thru the heart of Lush, a murderer and suicide, who haunts the spot. More than one suicide was buried here though, the latest being recorded in the 'Norfolk Chronicle' of April 17th 1813. Charles Candler in 1896 tells of an old man he knew who had actually witnessed the unhappy burial of this woman in 1813 when he was a young lad: "Creeping between the legs of the men who stood close round the grave, he saw in the gloom of the evening the parish constable fix the stake in position, while another drove it home with a heavy beetle, Mr. Oldershaw sitting his horse in silent charge of the proceedings". The woman, Mary Turrell, had apparently poisoned herself after being accused of killing her newly-born daughter, whose body was found in Vipond's pond at Harleston. The inquest on Turrell recorded a verdict of felo de se (self-murder), and as the 'Norfolk Chronicle' records: "on the same evening about seven o’clock she was buried in the high road with a stake driven through her body in the presence of a vast concourse of people." But she seems to have had another daughter also, for a subscription was raised in Harleston to send the girl to a refuge for the destitute in London. In 1828, the superintendent of the refuge wrote to an interested party "I am sorry to say that A. T. has been prevented by the Laws of her Country from producing the fruits of gratitude therein" - a "quaint paraphrase" as Candler puts it, for "A. T. is gone to Botany Bay". Charles Candler: 'Notes on the Parish of Redenhall with Harleston' (Jarrold & Sons, 1896), pp.80-1. W. B. Gerish: 'Norfolk Folklore Collections' (unpublished, 1916-18, compiled by William de Castre), Vol.3, p.118. A tunnel is said to connect the 14th century church of St. John, and the Old Hall (TG426026) built 200 years later by Henry Berney. A writer in the 1860s told how, while "waiting at the Reedham railway station some time since, I met with a native labourer, who told me that it was believed there was a subterranean passage, leading from Reedham Hall to the church; and that the top of this passage was frequently touched by the plough when working the land..." But the two are only yards apart! Source: 'The East Anglian, or Notes & Queries', Vol.2 (Jan.1864-July 1866), p.202. The Seven Hills barrows (twelve were visible two centuries ago, but only six now remain) on the slopes of Snarehill are said to be the graves of those slain in King Edmund's last battle with the Danes in 869 AD (TL905804 area). See also 'Edmund of East Anglia'. Alfred Suckling: 'History of Suffolk' (John Weale, 1846), Vol.1, p.xx11. Arthur Mee (ed. ): 'The King's England - Norfolk' (Hodder & Stoughton, 1940), p.336. According to tradition, the Danes were once laying siege to Thetford, but it became a stalemate. The defenders couldn't escape, and the Danes couldn't get past the fortifications of Castle Hill and Red Castle. Then a local shepherd named Tutt sold them out by showing them a passage through the westward marshes and a secret ford over the river. 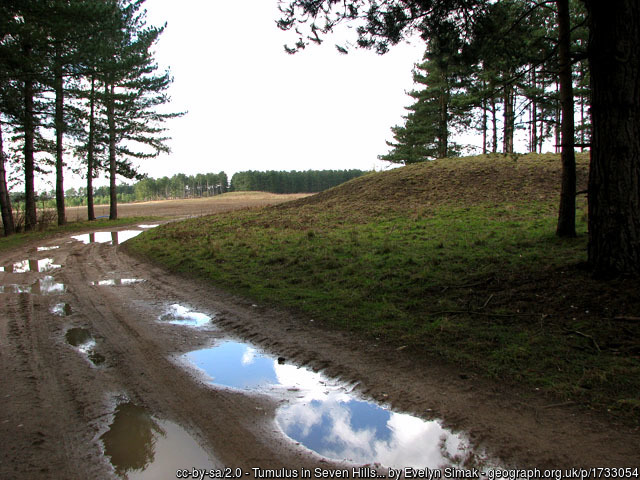 The Danes captured the town, then rewarded Tutt by hanging him on the mound that now bears his name, a Bronze Age bowl barrow at TL883813. Source: W. G. Clarke: 'In Breckland Wilds' (Robert Scott, 1925), p.163. 1. W. G. Clarke in 'The Eastern Counties Magazine & Suffolk Note-Book', Vol.1 & 2 (Aug.1900-May 1901), p.175. 2. 'Chalk East: A Geo-East Project' (Project Outline Document) 2009, p.6.